Interest rates at unprecedented lows are forcing investors to reexamine their hate for structured credit. Slowly but surely the CLO market is coming back in spite of the recent obstacles. 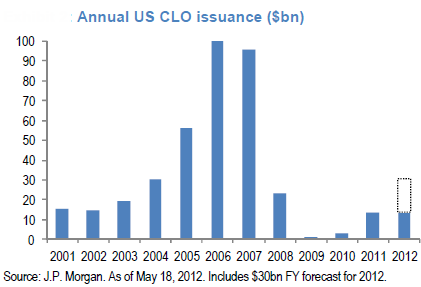 Based on this JPMorgan forecast, we are on target to get to 2004 CLO volume. It is highly unlikely the pace of growth will mimic anything that followed 2004, but relative to recent years, this is real progress. One factor that is helping this market is the diversification of buyers in the secondary market, as the next chart shows. "Real money" means insurance and pension funds who are key to finding a home for "AAA" tranches - the largest part of the capital structure. An active secondary market is key to growth in this business. 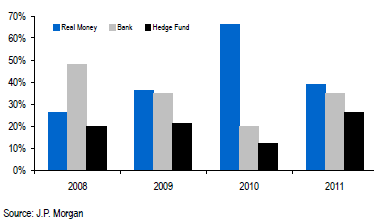 Hedge funds in particular are jumping into the game. In the long run this will help drive insitituonal leveraged loan volumes in the primary markets as new CLOs look for fresh collateral.